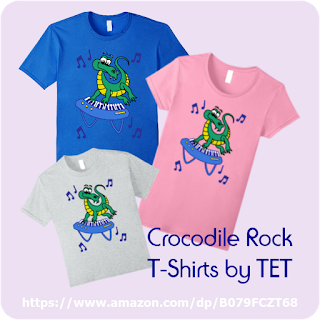 Crocodile Rock T-Shirts available from Amazon. Last October I entered my Crocodile Rock, cartoon character into a design a sock competition. The design wasn't victorious however, undeterred, the design is back as my very first printed T-Shirts on Amazon. Unlike other print on demand sites Amazon's service, known as Merch by Amazon, is a much more selective service when it comes to who can be a seller. You can request an invitation through their site but every step to being accepted is reviewed by an actual person, as are all the designs you submit for your merch. Once you're approved, you can submit up to ten designs, with a limit of one submission per day (Note it may be different for organisations). Each design must sell at least one order within the first 90 days of being approved for it to remain on the site. The intention being to ensure your catalogue of designs are ones people will buy, and so Amazon doesn't get a glut products no one wants (I presume). There are different tiers for sellers. Once you've proven yourself to be marketable you gain access to more products and are able to upload more designs etc. The main advantage for sellers is gaining access to Amazon's market place. Whilst you can (and should) promote your own designs, Amazon is pretty much a first stop for many people buying almost anything online. That's a huge advantage but it also means you're a very small fish in a very large ocean. Amazon does all the hard stuff like, processing sales, printing, and shipping your products, whilst you get to be the designer, and promoter of your work. As with any print on demand service, Amazon charges a base prize for each product whilst you decide for yourself what kind of markup you want to add to it for your royalties. If you're interested in trying Merch by Amazon for yourself check out my Crocodile Rock T-Shirt product page to see an example of how designs are listed (or check the page out if you'd like to buy a shirt, available in Mens, Womens, and Youth sizes, in five different colors for US$19.99). This is really great David! I hope you do well with this. I love the design! Thanks Johnny. I think it's one of my strongest T-shirt designs so I hope sales will reflect that. Hard to get seen on Amazon though.